Do I Need to Hire Two Cancun Wedding Photographers? Having a destination wedding is a thrill, and it’s something that you will never want to forget; that’s probably why we get so many questions about whether or not it’s necessary to hire two Cancun wedding photographers. The answer isn’t an easy one: “it depends on your situation”. Having been a bride before, I know that statement can be annoying, but it’s important to think about your ceremony, your reception, and your needs before you make a decision. For my own wedding, I made the decision to have two photographers. And it was a decision I will never regret. My wedding was in a place where canopy trees, Wisteria vines, and pushy, camera-wielding family members posed a significant photography problem. And I also had a mission to get the photo that none of my siblings had captured at their own weddings: the look on the groom’s face at first sight of the bride coming down the aisle. Whenever things are rough or I’m having a bad day, I still pull out my wedding album and glance over that look of pure love…the emotions flowing from the page make everything okay and still bring tears of joy to my eyes. But when you have a wedding at a Cancun resort, your situation is going to be a bit different, and there some considerations you need to make before you hire two Cancun wedding photographers. • Quantity and quality. When you hire two photographers, it’s no secret or surprise: you’re going to get more photos. After my own wedding I had more photos than I knew what to do with! If quantity is a big deal to you, then having two photographers might not be a bad idea. But it’s important to note that you will likely end up with a lot of shots that are near-duplicates of each other. Dean also believes that quality can sometimes suffer when you hire two photographers, depending on the photography company. Some photographers will have the secondary photographer act as primary and will sit back and take few photos, leaving you with fewer photos and without the quality you were paying for. After all, you hired the primary photographer for their skills, not those of the secondary photographer. • Cost. When you hire two wedding photographers, you’re paying for two photographers. That means your photography is going to be more expensive. If you’re on a tight budget, the cost of two photographers may be prohibitive. • Setup of the ceremony and reception. 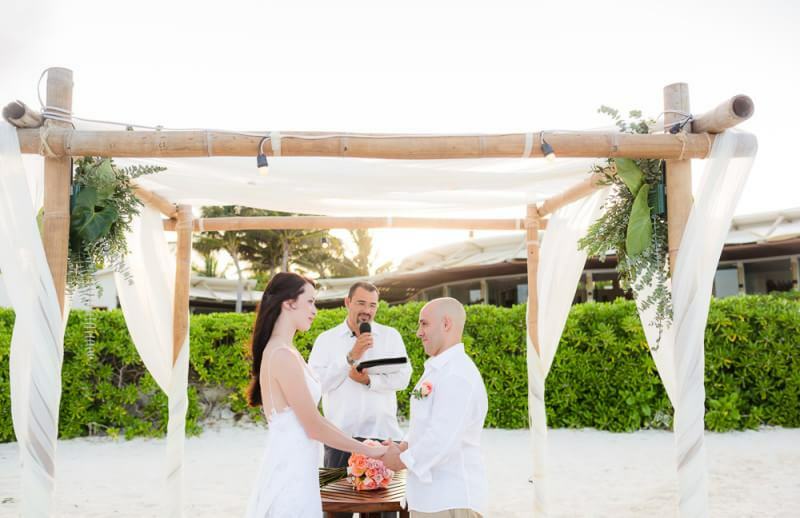 When you have your ceremony and reception at your Cancun resort, everything is all in one place and one Cancun wedding photographer will likely be able to handle the job. Dean photographs somewhere between 80% – 90% of his weddings on his own, and if you’ve looked around the web site, you already know what’s possible. • What memories you want. If you really want coverage of every minute of your wedding from start to finish, you may need two photographers, especially if your wedding is going to take place over several hours. But if you really want to capture the memories, moments of love, and true emotions flowing through you, your partner, and your wedding guests, one excellent photographer can make that happen. Having two photographers, however, can also allow the secondary photographer to maintain the standard shooting locations while the primary photographer goes out for more amazing shots. • Style. If you and your partner have remarkably different taste and style, having two photographers at your wedding might make sense so that the memories are captured in ways that make sense to both of you. The two photographers at my own wedding had very different styles—more creative and flowing to match my own personality and more structured to match my husband’s style. It turned out perfect. If you decide to hire two Cancun wedding photographers, it’s important to think of the photographers, too, and to hire a team, not two separate photographers. Every photographer wants to do an excellent job and get the best shots possible. Maintaining a good relationship with your photographers and getting what you want will be more difficult with two separate photographers. My photographers both came from the same studio, so I was able to count on them to work together to capture the most important and beautiful moments of my wedding. The most important thing to remember when you hire a Cancun wedding photographer is to find someone who will do a high quality job. One quality photographer is better than two decent photographers, and that can really make a difference in your photography. I was lucky enough to find a studio with two excellent photographers. If you’re not sure whether you need or want two photographers or one, email me and we can figure out your needs together, and then book the package that makes sense for you. Or, you just might get to wrangle some more embarrassing wedding stories from my own wedding and some others I’ve been to and been a part of…and been drenched at. You decide.